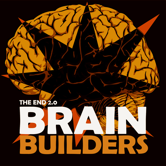 Danish powerhouse jazz/fusion band THE END 2.0 third release “BrainBuilders” has fulfilled every promise. The new CD presents the new members of THE END 2.0, Swedish saxophonist Tomas Franck, Cuban bassplayer Yasser Morejon Pino and Swedish/Italian drummer Niclas Campagnol alongside vibes/keys/percussion player Morten Grønvad. The all new original material - all great fusion stuff - written, arranged and produced by Morten Grønvad, shows an influence from Cuban music mixed together with the characteristic jazz/fusion style of THE END.